Vista Print is one of the largest online printers. So we aren’t surprised that they’d have the most fold over business card templates to choose from. But we were surprised to find that they had 4891 templates! That’s rather amazing! (See three example templates in the pics to the right.) For the inside of the card, choose between blank pages (not exciting but useful for people to take notes), greyscale or full color printing. Pretty much anything you can think of can be printed inside the fold: photos, text, graphics, even maps! Simply type in a address and Vista Print will automatically insert a map of the size and type you want. By the way, if you are looking for regular non-folding business cards Vista Print will print up some free ones for you. 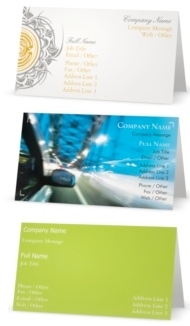 Print Place is your website if you want to use your own design for a folding business card. The site provides clear, detailed instructions on submitting your design. There are, however, two potential downsides: First, the minimum number of cards you can order is 250 (although many people would want at least that anyway). Second, you have to fold the cards yourself after they arrive (although they are scored to make that easy). The good news is that the prices at Print Place are incredible. With the basic options, 250 folded cards will cost you around US$0.26 each. And, the overall cost of a 1000-card order isn’t much more than it is for 250 cards, bringing the cost-per-card down to just 8 cents! 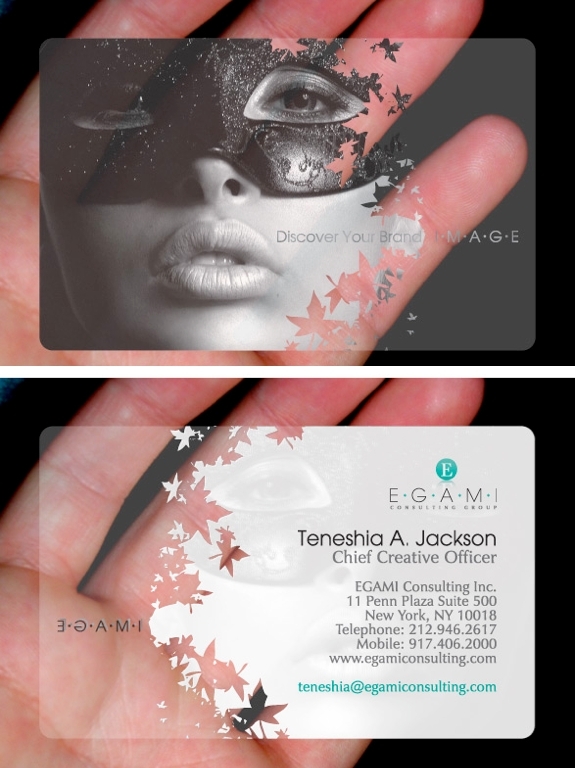 Plastic cards both feel and look cool, especially when they have a translucent element to them. Unfortunately, they are also a bit pricey (typically around $2.50 each, though it depends on the printing method and how many you order). They are also rather environmentally unfriendly — much more so than paper (whether recycled or not). Still, if you are going to choose plastic cards then Plastic Printers is your place. We aren’t fans of their website design, but their email-centric customer service is outstanding, as is their quality of their work. If you want a custom-sized card, Plastic Printers will work with you on that too. 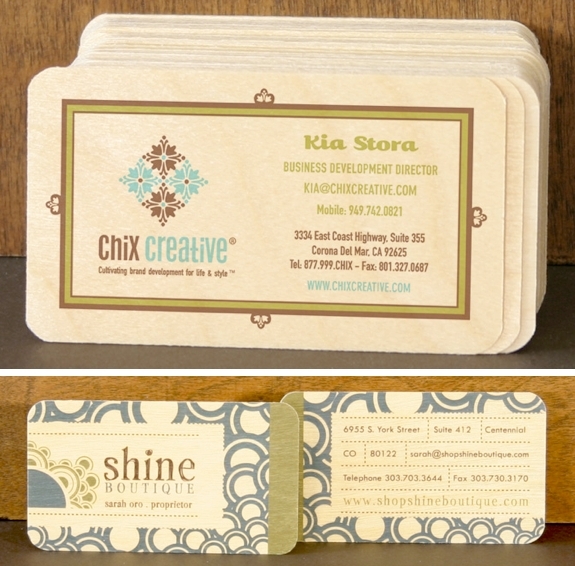 Night Owl Paper Goods prints business cards on real birch, cedar and cherry wood. The resulting look wouldn’t work for everyone — the CEO of a hot high tech start-up, for instance. But if you want to exude an earthy charm, these cards make an impression. The wooden business cards have a bit of texture to them (hard to see in the photos below) and won’t easily break. They’re also less expensive than they look, though at around $1 each they aren’t exactly cheap. Happily, Night Owl uses eco-friendly, sustainably-harvested wood for both their traditionally-shaped business cards and their cool-looking square ones. Two photos on one business card? Snapily — the cool printer of animated and 3D items — can pull that off. Face one of Snapily’s animated cards directly towards you and one image appears. Tilt it up or down and you’ll see the other one. Snapily has 47 templates to choose from. But the cool part is: You don’t need them. Upload two of your own photos to the Snapily website and they’ll print those in an animated card. As with all the websites in this review, the per-card cost for an animated card depends on how many you order. Snapily lets you order in any denomination of 20; for 200 cards you’ll pay a bit less than $1 per card. 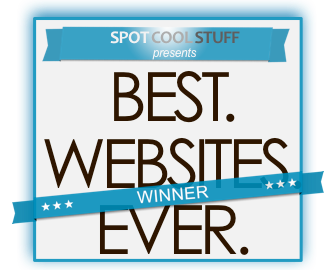 When you’ve got the word “cool” in your name, as Spot Cool Stuff does, there’s a lot of pressure to present a business card that stands out. Which is why, since the first day we formed our company, our own business cards have been printed by MOO. To be sure, there are other business cards that are more flashy, more unusual and more weird†. But absolutely no other company offers business cards for so little money but with so much WOW factor as does MOO. Our MOO cards cost as a grand total of $0.25 each and we get raving comments (eg. “You really can spot cool stuff!”) on our cards all the time. Here’s how it works: In a pack of 50 cards, every card can have a different image on one side. (You aren’t required to have a unique image on each card; images can repeat on cards if you like). 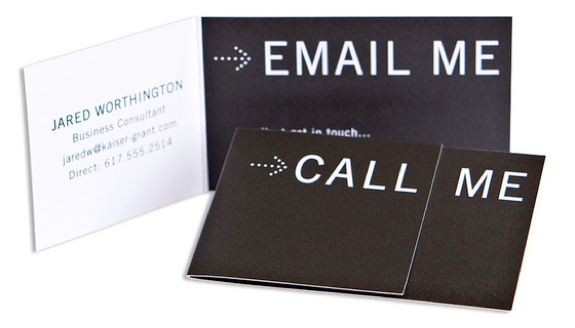 What’s on the other side — typically your name and particulars — is the same on every MOO card. Sounds simple, but the creative possibilities are endless. If you are a photographer or designer, you can show a different example of your work on each card. If you are a publisher, each card can feature a different book cover. Real estate agents can show photos of different houses they’ve sold. Restauranteurs can have photos of different dishes. 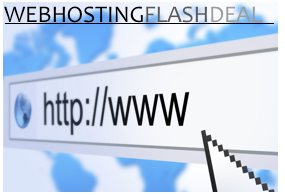 What Spot Cool Stuff decided to do is have each of our employees’ cards have a different image from our website along with a redirecting URL to the corresponding post‡. 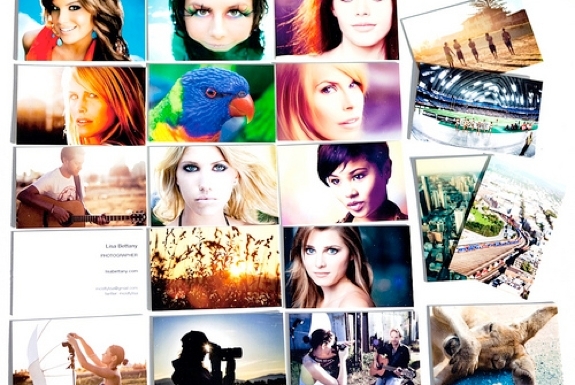 If you don’t have your own images you want to use, Moo has hundreds of templates to choose from. Some of their designs are literal, others are abstract, but most are cool in some way. And several of the MOO-designed cards leave space for you to add your own logo. The pics below are all of standard Moo designs you can choose. † While living in Nepal we were once handed a business card that was an edible cookie! The man who gave it to us literally had his name and contact info engraved in the dough of his cookie-card. We thought it was a creative idea. And we would have sent him an email telling him so if a hadn’t bird hadn’t eaten his card after we left it too close to an open window. ‡ We can see how many times people go to the redirecting URL. There are cards that we’ve only handed out 3 or 4 times for which the corresponding URL has been visited nearly 100 times. Maybe our cards are being passed around from person to person? Love the plastic cards! Thanks for posting this. Many of my clients would enjoy this. These are some really neat ideas for business cards. I think those plastic cards are really cool but might not be very practical from a cost standpoint. It would definitely make you stand out though so it could be worth the extra cost. Thanks for the great article. thanks for this excellent review. now all the business card designs i could possibly need for any occasion are in one place. i’m sharing this my friends… i am particularly intrigued by the 3D cards. That is really creative. I usually purchase business cards, but with the tips you have shared I will be making them myself.